This article was written by Don Jacobsen and was originally published on the Star Tribune here. 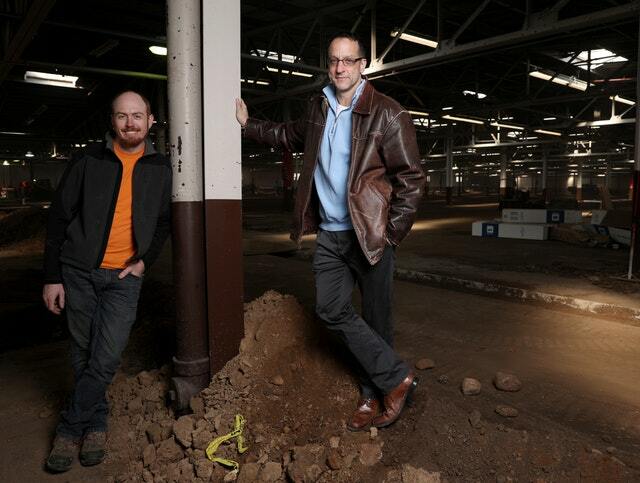 A key element of the push to transform St. Paul’s Westgate industrial area into a mixed-use showpiece got underway this week with the start of a restoration project on a massive 1940s warehouse near University Avenue. The industrial area includes about six city blocks nestled into an area bounded by University Avenue to the north, Hwy. 280 to the east, Interstate 94 to the south and the Minneapolis border to the west. In the years following World War II, it was one St. Paul’s busiest industrial hubs with the presence of tractor manufacturer International Harvester and a Weyerhaeuser Co. lumber operation. The first big change to Westgate came in the 1980s, when the St. Paul Port Authority financed the transformation of the 320,000-square-foot former Harvester tractor manufacturing building into the Court International office complex, now owned and managed by Suntide Commercial Realty. The next big event came in 2014 with opening of the Green Line light rail, which the Metropolitan Council said has triggered $2.56 billion in development activity along its non-downtown Minneapolis stretches. Its Westgate station is bordered by recently built apartments. In the last few years, the pace has accelerated rapidly, with apartment developer Dominium acquiring the Weyerhaeuser site for redevelopment of up to 600 housing units and the construction of a new office building by Sunrise Bank. Now the last big remnant of the area’s industrial past is beginning its makeover: Suntide this month began rehab work on a 174,000-square-foot, one-story brick warehouse built by the Case Corp. in 1948 as a tractor parts distribution building. The end result will be the Case Building, designed as a destination for “creative office” users and retailers, including, of course, a microbrewery with access to a long outdoor patio. Suntide Commercial Realty business development director Mike Cylkowski said his firm pulled the trigger on starting the project — which was first announced in 2016 — after recently landing an unnamed major tenant for more than 50,000 square feet of the sprawling space. The project is being overseen by Max Currie, a Suntide principal and its director of construction. His vision for the space includes the creation of an interior, common-area “streetscape” running down the center of the warehouse, anchored by a 30,000-square-foot tenants’ common area. During a visit to the building this week, Currie pointed out that each of the warehouse’s small, functional windows will be replaced with more than 60 expansive openings fitted with energy efficient glass, flooding the now-dark space with new light. Its ceilings are 13 to 18 feet high, giving them an “industrial” feel, and are reinforced by a sprawling latticework of hand-riveted steel girders, which will be cleaned up to provide an unusual aesthetic feature. Dozens of small skylights already brighten the space. Its southern facade will get a sizable patio connected to a potential brewery space. Cylkowski said he’s actively seeking a craft brewer for the spot. For Suntide, the Case Building project might be able to share amenities with its neighboring Court International building. Meanwhile, the building is also a major part of St. Paul’s public realm plan for the emerging Westgate industrial area. The city last year purchased several acres of the Weyerhaeuser site from Dominium for a potential new park; the plans also include the transformation of an abandoned rail spur and bridge over Hwy. 280 into a bike-and-pedestrian trail connection running past the Case Building.